Siberia sounds like a place at the end of the earth: a desolate, frigid wasteland surrounded in mystery. 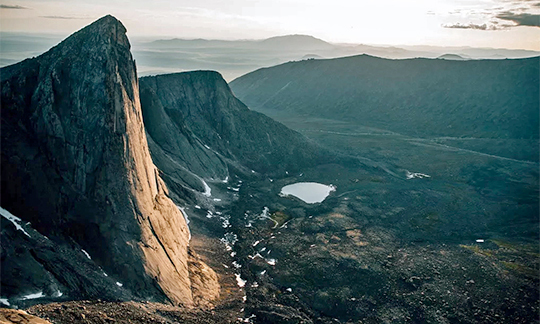 However, visitors are rewarded with incredible climbing on sweeping cliffs up to 1,500 feet tall located north of Bilibino in the Chukotka region of northeast Russia. 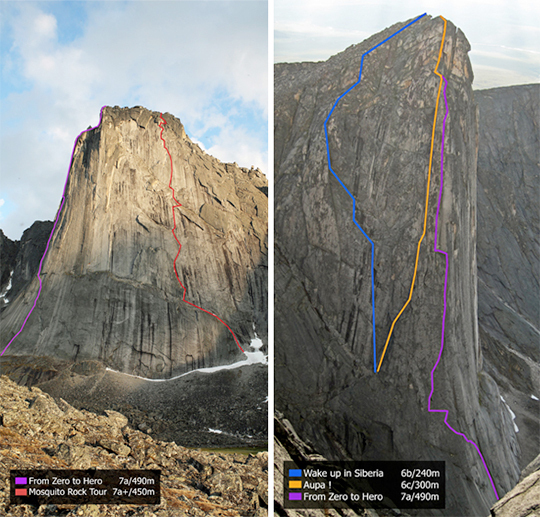 In the past two years the area—with 24 hours of continuous daylight during summer—has seen an increase in climbers making the long journey. 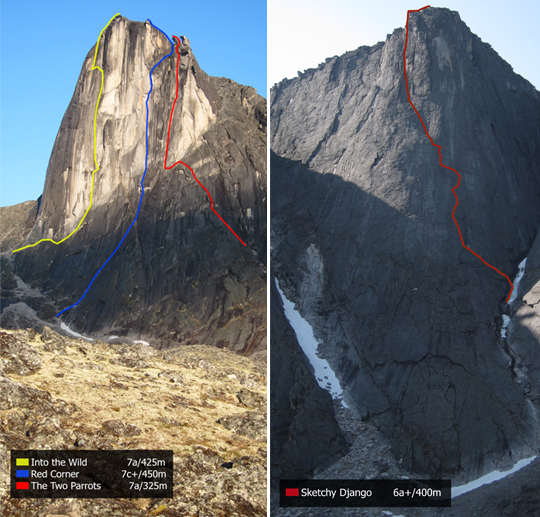 One reason is a story we posted on Alpinist.com last year called Slideshow: Unclimbed Big Walls of Siberia. We wrote on social media in 2014: inspired by a single photo, Australians Chris Fitzgerald and Chris Warner visit unclimbed big walls in remote northeastern Russia. Pulling out moss clumps and excavating gear placements with a nut tool, the team established six new routes. Despite the allure of tall, unclimbed cliffs, it's very difficult to reach the area—connecting flights are followed by a long, slow ride in four-wheel-drive vehicles, then a multi-hour hike to get to the walls. Once there, your troubles aren't over: mosquitoes constantly buzz your face until you start climbing. This past summer, Basque brothers Eneko and Iker Pou, accompanied by Europeans Hansjorg Auer, Jacopo Larcher and Siebe Vanhee, visited the range. The team climbed nine new routes, placing only a few belay and protection bolts. The day after they arrived in early July, they climbed the East Face of The General, with the Pou brothers swapping leads up a sharp dihedral system on the right side of the face, while Auer, Larcher, and Vanhee jammed cracks up the middle of the wall. Their respective routes, Wake Up in Siberia (6b, 240m) and Aupa! (6c, 300m), were established in alpine style. Mosquito Rock Tour (7a+, 450m), by the Pou brothers, came next, followed by From Zero to Hero (7a, 490m) by Auer, Siebe and Larcher. Rainfall and a waterfall plagued the ascent of Zero to Hero. And, at times, the team resorted to Beaks and other pitons to protect terrain. Three routes up The Commander followed: a long chimney-finger-and-hand-crack route called Into the Wild (7a, 425m), by the Pou brothers. Auer, Larcher, and Vanhee climbed Red Corner (7C+, 450m) and the Pou brothers climbed Two Parrots (7a, 320m). The team focused on the obvious lines, instead of seeking out the most difficult terrain they could find. "The rock is better than I expected; not dirty at all," Auer said. Auer, Siebe and Larcher climbed the first ascent of The Monk via the slab route Sketchy Django (6a+ 400m), which was often protected by Beaks and other pins. "The rock was amazingly structured and had very big crystals which made the slabs easier then they looked," Vanhee said. "The difficulty of this line is definitely the protection." Vanhee continued, "Being so high up in the Northern Hemisphere, the team had the opportunity to choose their climbing rhythm because of the 24 hours of sunlight. The disadvantage of being close to the Arctic Circle was the thousands of mosquitoes. This little insect made the basics of living a challenge." In late July, Australians Chris Fitzgerald, Natasha Sebire and Gemma Woldendorp arrived in the area. (Fitzgerald first visited in summer 2014 and climbed The General and The Commander—Ed.) 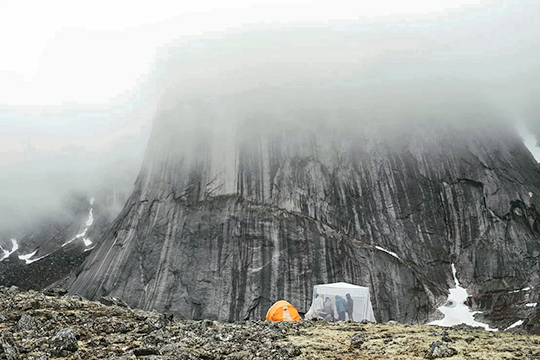 The team journeyed eight kilometers from The Commander and General to climb a 500-meter-high, one-kilometer-long, northwest-facing wall named Finger Crack Cirque (by Fitzgerald and Warner in 2014). Here they established three long routes on the cliff: The Propusk (6a, 290m), Vodka and Lemming (6a, 525m), and Orbital Sander (6c+, 440m). Then the season changed, bringing early snow. With the walls plastered in white and cracks seeping with icy moisture, the team abandoned plans to climb The General and The Commander and headed to unclimbed Weasel Tower. After bivouacking near the base, they made the first ascent of Siberian Summer (6b+ A1, 160m) in cold weather. "I found it a test of willpower, with my toes feeling like wood and my fingers numb," Woldendorp said. The third group to arrive were the climbers, Simon Smith and Graham Dawson, who used ATVs and dirt bikes to reach base camp. They arrived during the unseasonably cold weather which pinned them in camp for much of their stay. With cold hands and feet, they made the first ascent of Ilium (E4, 300m) on The General. To pass the time in camp, they drank medical-grade ethanol mixed with boiled candy, Smith told ukclimbing.com. A permit is required to climb near Bilibino. The three teams were able to enter the region without permits but had to pay fines. "It is a cryptic process getting this permit, but it is a necessary one for future teams, who need to contact the Chukotka authorities at least three months in advance," Woldendorp said. The remote region is not visitor friendly yet. Rumor is that only three tourists visited Bilibino during the last 10 years. 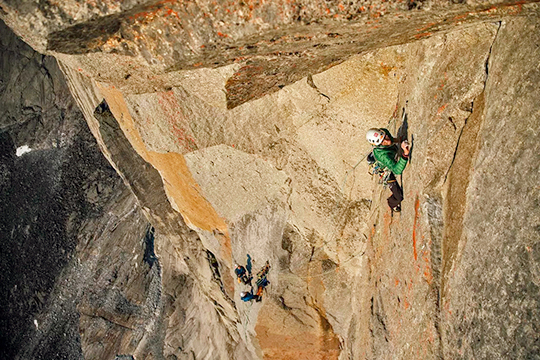 Summers are short in Siberia, and it's hard to find optimal climbing conditions. Go too early, and you'll potentially be surrounded with mosquitoes. Arrive too late, and you may experience bitter winter-like conditions.